Opposition Members of Parliament are annoyed that while nurses are striking country-wide, Government is spending huge sums of money to finance a private wedding ceremony for a 98 year old Mongu resident. The MP’s expressed anger after their counterparts from Western Province received letters of invitation on official letterheads from provincial administration. The MP’s say they are neither against the old man remarrying nor being invited but are against the idea of the Government taking official position. The Members of Parliament say the development is a clear indication that even the reported wedding of Kenneth Kaunda to Chieftainess Nkomeshya will be footed by the government. “This is a clear indication that even the marriage between Nkomeshya and Kaunda as reported by the Watchdog will be financed from government coffers because the provincial administration can’t do this minus the President knowing. 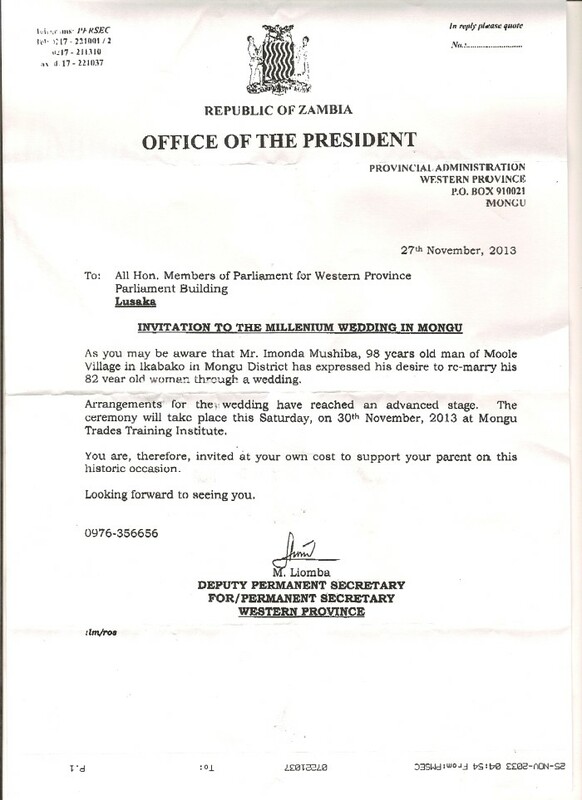 Look at the letterhead its official” one of the MP’s said. Other information reaching the Watchdog is that this wedding of the old man is being blown out and propagated to the four corkers of the country to justify the wedding of Kaunda to chieftainess Nkomeshya. It looks like the government and its newspapers want everyone to hear about the wedding of the old man in Mongu so that when Kaunda marries it will be business as usual. A 98 year old Imonda Mushiba will today November 30, 2013 re-marry an 82 year old woman at a ceremony were some sources say Western Province Permanent Secretary Amos Malupenga will play the role of a best man.